Whether you are creating a homemade card, a scrapbook layout, or you are making home decor, the best cardstock for scrapbooking makes all the difference, as is the case with an project material. We have a large supply of designer scrapbook cardstock from which to choose. 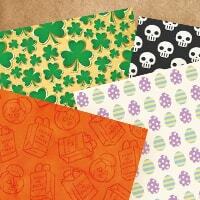 We have solid colors and intricately scrapbook paper. Shop the best names in the business with CraftDirect.com and save. Patterned Scrapbook Paper - we have so many themes, colors, and patterns to choose from. 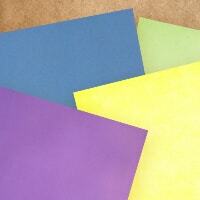 Colored Cardstock - these are the most versatile stacks you will find. 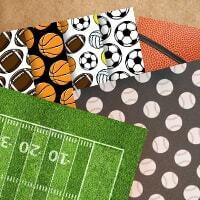 Sports Scrapbook Paper - great for making layouts for your little athletes. 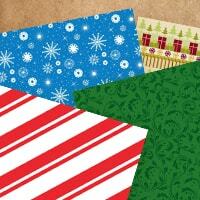 Christmas Cardstock - save on material for your favorite holiday. Seasonal & Holiday Paper - here we carry all holidays and seasonal themed paper packs, except Christmas. Homemade Cards - If you are into card-making, we recommend you go with 6" x 6" paper stacks. They are cheaper and it makes more sense to use 6" x 6" paper to make a 4" x 6" card, as opposed to scrapbook paper meant for making big layouts. Scrapbooking - In this case, you'll most likely want to go with 12" x 12" paper stacks. With cardstock you can easily mount your pictures on your scrapbook pages, cut out cute designs, and even write your favorite quotes and sayings on the paper. 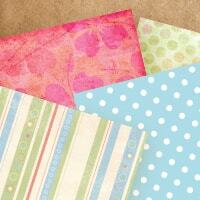 There are so many great ways you can incorporate cardstock in your scrapbooking. Home Decor - Creating your own home decor is so popular right now. Almost everyone is doing it and there are so many great things you can create and design for your own home. You can make homemade picture frames with a cardstock design, word blocks with cardstock attached to them or even cut out your favorite cardstock designs. You will love all the ways you can use cardstock in your home decor. Gifts and Presents - We all have various gifts we have to give throughout the year. Our cardstock makes it easy to make your own gift boxes and tags. Cardstock gift boxes and tags are not only trendy but a great way to save money on gift packaging. You can pick out all your favorite colors and designs to make a beautiful present for someone you love.